Describe the situation as good as posible. What was your last action? What happend? If possible include screenshots. In the Shopping Cart under the section Currency And Coupons, enter your code in the Coupon field. Click Enter, and make sure that the amount in the total gets updated. If the application was successful then continue the purchase process. If you do not succeed, then send us an email and we will check with esellerate what we can do. Stay informed about new releases, new videos and promotions by following us on twitter/PitchFeedback or facebook/PitchFeedback. If you move the application to a different place than /applications, you must keep the path short: the total path length to the directory where the application is, may not exceed 87 Characters (including slashes). If the path name (in case you move the application) contains non standard ASCII characters, the program will not start. If you forgot to install Quicktime from Apple the following message will appear: "This application has failed to start because QTMLClient.dll was not found." Unfortunately, the application does not run without QuickTime installed. You get the same error message if you did not restart the computer after installing Quicktime before starting ListeningSingingTeacher. Multiple versions of Quicktime: If you get the error message "The procedure entry point for CFRelease could not be located in the dynamic link library QTMLClient.dll" or "The application or DLL C:\WINDOWS\system32\QTMLClient.dll is not a valid image. ..." then you probably have an old version of QTMLClient in C:\WINDOWS\system32. ListeningSingingTeacher needs a newer version which gets by default installed in C:\Program Files\Quicktime\QTSystem. This should be the only version of the file qtmlclient.dll. To solve the problem see section "Multiple Versions of Quicktime". Latency issues under Vista. Under Vista not all sound cards are supported and the software emulation introduces unwanted delays. Windows 7/8 an 10 have a much better sound model and should not show this behavior. See section "Testing Latency"
Program does not start after installing new version. Some older versions did install support files in the wrong place. You have to manually remove these files. See "Program does not start after installing new version"
2. You can unpack it with WinRAR or other decompress tools. 3. You will see 4 files in the "exe" file, it’s actually a package. Don't install with QuickTime.msi, you'll fail. 4. Install AppleApplicationSupport.msi and AppleSoftwareUpdate.msi. It's better to install AppleApplicationSupport since actually AppleSoftwareUpdate is the key one. 5. Open AppleSoftwareUpdate you just installed. After checking new versions, you may see QuickTime in the list. Install it. Just above the start menu a searchfile appears. Enter QTMLClient.dll. On Windows 7 the search starts automatically. Click the magnifying glass Search Everywhere. In the upcoming Window click Advanced Search. And activate the checkbox Include non-indexed, hidden and system files. In the Name field enter QTMLClient.dll and click on search. Click "Start" --> "Search". On the left bottom click "Click here to use Search Companion". In the upcoming window click "More advanced options" and select "Search system folders", "Search hidden files and folders" and "Search subfolders". In "All or part of the filename" enter "qtmlclient.dll" and click the "Search button. You should find at least one version of the file QTMLClient.dll in C:\Program Files\Quicktime\QTSystem. If you find other versions beside C:\Program Files\Quicktime\QTSystem rename those versions. Be cautious and do not delete the other versions, just rename them for a test and reboot the system. Start Listening Singing(Music Teacher again. If you then get problems with other programs re-rename the renamed version back to the original name, other programs may need this older versions. If the folder AppData is not visible in the Explorer, then you must first un-hide the folder by turning off the "hidden folders" feature under the Edit menu >Folder Options. After deleting the directory, don't forget to hide the "hidden folders" again. Check if a folder named AlgorithmsAndDatastructures is present in the ProgramData directory. If the directory AlgorithmsAndDatastructures exits, then this directory was mistakenly created by an older version of the program. Delete all directories and files under AlgorithmsAndDatastructures, and then delete the directory AlgorithmsAndDatastructures. Start the program that stopped working again: it should now start (no re-boot or re-installation should be necessary). Create a new local login user on your system: e. g. "User English". (Change PC Settings > Accounts > Other Account ; Click "Add an account", click "Sign in without a microsoft account"; Choose "Local account"). Open Regional and Language Options by clicking the Start button Picture of the Start button, clicking Control Panel, clicking Clock, Language, and Region, and then clicking Regional and Language Options. Under Display language, choose English from the list, and then click OK. Choose the lesson: "Scale: Sing after me". On the next page click "Start". On the appearing "Exercise Options" dialog, select "NoNote" for "Note Assistance". Under "Sound Options" set "Beatclicks" from "noClicks" to "beatClicks". Click "Go" and be quiet, so that the system can record the beat clicks. In the upper part of the Window, where the bouncing beat ball line is shown, check if the beat clicks get a green marking. If they are blue and lag behind the white reference line, the system has a latency issue. That is the sound needs too much time before it is hearable through the speakers. In this case the program is not suited for your computer hardware (Vista users: Upgrading to Windows 7 may help). Not all midi files contain a lyrics track. Sometimes the times-stamps for the lyrics track are set to appear before the actual midi note sound. This has the advantage for the performer that the text gets highlighted just before the note is active. Unfortunately, Listening Singing Teacher can not always assign the lyrics to the correct note in this case. In other cases the melody track is split into two or more tracks. For example the solo will be played on a saxophone track and the common refrain is played on a trumpet track. However, with Listening Singing Teacher you can only assign one track to the melody. In this way, midi files which use this technique make it more pleasant to listen to the music, but the single tracks will not contain the whole melody. Therefore there will be "missing" parts on the staff when imported by Listening Singing Teacher. To overcome these problems, you must have a midi editor, which allows you to add or adjust lyrics time-stamps or to merge two channels into one again. What do I get for the payment? Payment permits continued use of this version of the installed software on the computer the software was installed and access to all lessons. There is no warranty on the software. The tracking down of errors on other machines than ours is far too complicated. If you discover a software fault, please notify us. In short, by paying you are allowed to use the program as it is, as long as the program works (e. g. operating system changes may make the program unusable). Can I print the statistics or songs? Unfortunately, this version does not contain a print feature; you must make hard copies of the windows (use the application grab from the utilities folder). The songs and exercises may be printed from other applications, which can read abc-music notation. The songs can be found in the lessons directories (right-click the application icon and choose “Show Package Contents”. In the new window navigate to “Contents” and “Resources” and then double click on the desired lesson folder). Why this fancy licensing terms, like the use of software is all at your sole risk? In today’s modern world, where everybody can sue everybody for everything, one has to be cautious. Assume you are a super soprano, and you can break glassware just by singing. Please do not blame Listening Singing Teacher for such achievements; we are not willing to pay for that. Even worse, if you are a bass singer, which could destroy Jericho (hopefully you do not live in New York) … You get the idea! Software is very complex, and computers are configured in different ways (and maybe have some problems on there own, it may even be important in which order you installed software), we cannot predict the behavior of the program. Therefore the risks to download, install or run the software is all at your risk. If you are very insecure and think if you stay at home all the time then you are safe, okay. If you fear that this software can destroy your computer or data on your computer: do not download, install or run this software. We really cannot guarantee that the server from where you download the software has not been hacked or that during the transmission no manipulations were made. What happens if I do not register after using the program more than 10 hours / 100 days? Nothing. You break the rules. Please be fair, a singing lesson of an hour with a real teacher, costs approximately the same as the license for this program. Of course a real teacher can get you additional important feedback on your posture, the breathing and other things, so you cannot compare the two approaches with each other. Many people will try this program for free, and they are allowed to do so: for ten hours (programs LST, LMT) or 100 days (programs LET, TCR, SPP). If you still use the program after that time limit, it seems that the software is useful to you: therefore paying is only fair. There is no support hotline. However we are interested in improving the product. If you find errors or experience program crashes, let us know. Tell us also about documentation errors, sound errors or any other improvement possibilities of the program. If the program stops unexpectedly, see in the system console log for error messages. If the problem can be documented by the recording, export the recording and send the recording along with an error description. Check if you can download a newer version with the same major version number. If so, back up your old version, before installing the newer version and try to reproduce the error with the new version. If you get no or a wrong pitch responses from the program, please check in the replay mode what was recorded. If nothing gets recorded, check the sound control panel if the default input device is working correctly. If the input level is too low, increase it with the slider. If this does not work, you may have a microphone, which is not suited for that input channel. Expensive microphones often need special pre-amplifiers! The input channel must support microphones, line-in input channels expect a higher voltage signal than what you will get from microphones. There may also be a separate control panel for your digitizing device to adjust the sensitivity, check your hardware manuals. If you hear a lot of background noise, make sure nothing else is disturbing you. If there are clicks, chirps or hissing hearable, you might have unshielded microphone cables, which pick up electro-smog, or the microphone itself picks up a grumble from the 50/60 Hz power outlets. Try to reposition the microphone/cables. Make sure that the loudness display is in a correct range. If you make no sound, the sound control panel should show zero input level indicator lights or a maximum of two. If everything seems to be in a good range then make a hardcopy of the particular situation and export the recording, before mailing. Send all the information (e. g. Computer Model, RAM, graphic card, audio equipment, etc.) you think might be helpful in resolving the problem to the address given in the Contact page. No. 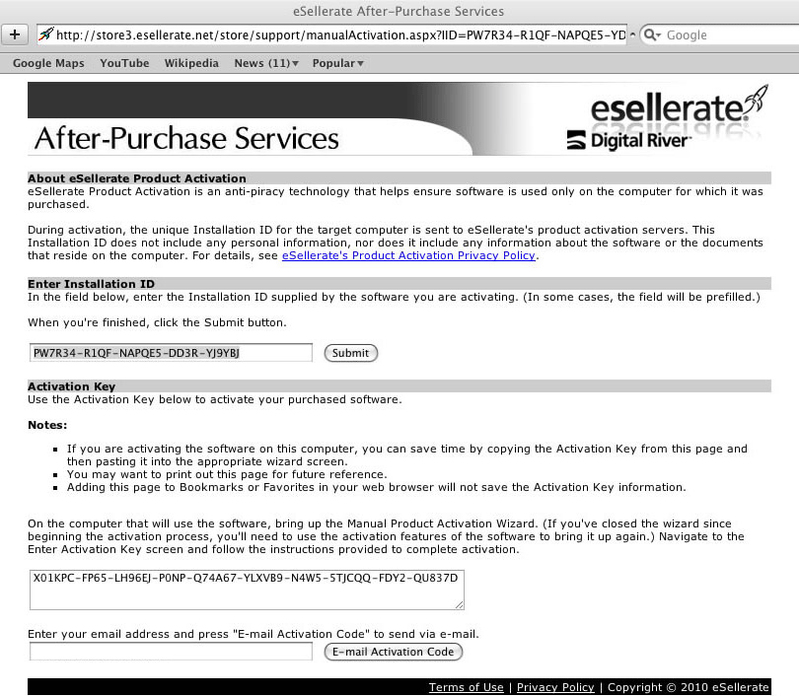 You only have to be online for the download and the activation of the serial number. In the applications Utility Folder open “Audio Midi Setup”, and Select the “Audio Devices” Tab. From the “Default Input” Drop down Menu choose your microphone and in the “Properties For” also choose your microphone (see below). Drag the slider on the bottom of “Audio Input” to the right. Also make sure that the selected format is 44100.0 HZ and one channel 16 bit (1ch-16bit). In the control panel choose "Harware and Sound". Click on "Manage audio devices". Highlight the microphone and click "Properties". In the up-coming "Microphone Properties" Window, select the "Advanced"-tab. Make sure that the default format is set to "2 channel, 16 bit, 44100 HZ" and in the Exclusive Mode Section both features are set. If you have more than one input device, make sure thet in the recording -tab the Mikrofon is set as the default. If the input is too low, click the "Levels"-tab in the "Microphone Properties" Window, and then move the slider to the right. Please do not confuse these three numbers. a) Start Listening Singing Teacher on the computer you would like to use the product..
b) On the "Select User" page the Serial-number field should read "Trial-Version". c) Enter your serial number from the confirmation mail. Entering the serial number manually has the potential to make mistakes (8 for B, O for 0, etc). So a better way is to use the button "Paste" which is on the same line as the serial number field. After clicking paste check visually that the beginning and the end of the serial number are ok.
d) Make sure you have an online connection, then click the button "Activate". h) The installation ID is hardware dependent and will be pre-filled. (If the field is empty then you probably started a manual browser window. 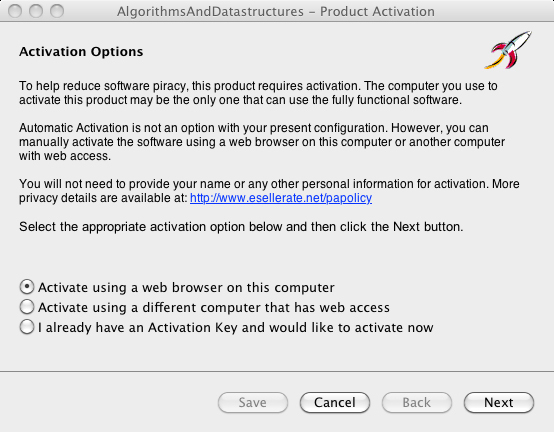 Go back and click the link in the Web Activation window). (Your pre filled data are of course different, this pre filled data get calculated from the serial number and hardware components of the computer (So I do not know what esellarate exactly uses. 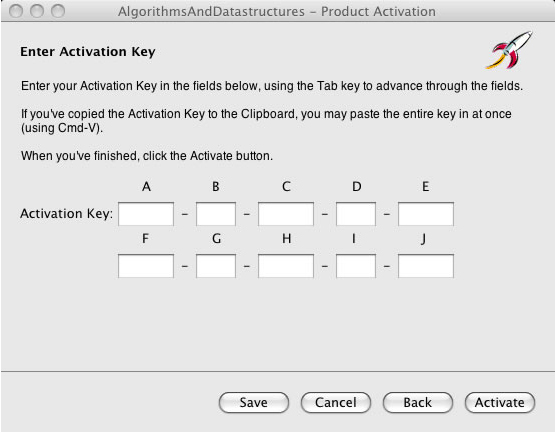 But this process allows to calculate an activation key for a computer which is not online. This means you could enter the installation ID (of an offline computer) on a computer which is online and get an activation key back for the offline computer.)). 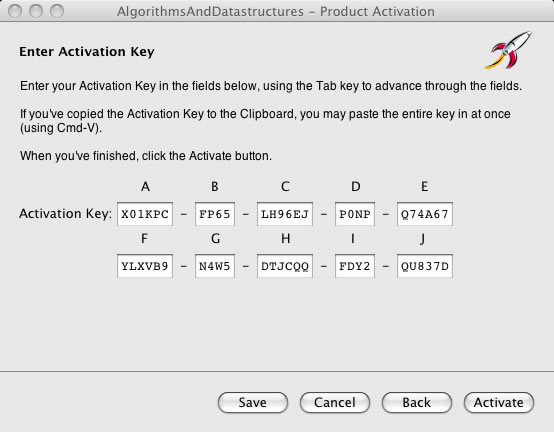 i) In the lower window part under "Activation Key" the field should now be filled with an Activation ID: Mark and copy the activation key. Close this window. j) The "Web Activation" window should be visible again: Now click "Next". k) The Enter Activation Key window should appear: Paste the activation key. 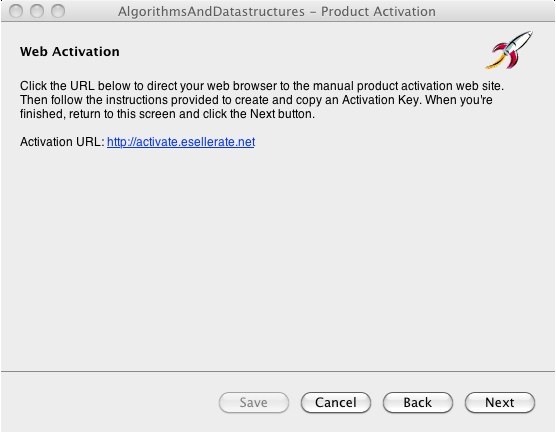 Click "Activate". l) You should be brought back to Listening Singing Teacher. The button "Activate" in the Select User page should now read "Deactivate". And all lessons should now be available. Please let us know if you get a problem during the steps a) through l). You have to be online to activate the program. If the machine cannot be taken online, you should write down the Identification key you get in step f) and do the following steps on a computer which is online until you get the activation key for that machine. With the activation key you get, you should be able to do an activation on the machine without having an online connection. Already Registered but Serial Number not shown? The message "Serial number reset" should appear on the bottom. Then try the manual activation again. If you still have problems reactivating your program, please let us know by sending us an email and your serial number.